Yes I went down t'pit. Well it was just for a visit actually. Yes, some go and have tea at the Ritz but I went down t'pit. 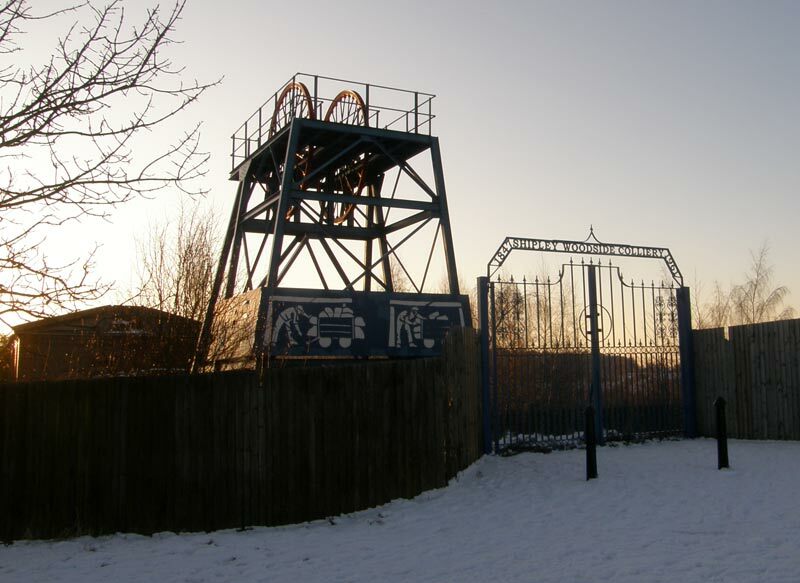 Seriously, many years ago, Les Webster, a man who was passionately concerned about the miners and their working conditions asked Walter and I if we would like to go down Mapperley pit to see what it was like for the men who spent so many hours underground. Walter was not keen on going but I thought it would be interesting. I wish I had made some notes at the time for this was more than 50 years ago and my memories of it are a bit dim. A group of us went up to the pit on a Sunday morning and were equipped with white helmets with a lamp attached to the front. We stepped into the cage and were soon at the bottom of the shaft. I was amazed at the size of this area and how the walls had been whitewashed. Then we went along a tunnel and once again I was astonished, this time by how rough the path was and how many things there were to fall over such as the electric cables. We did not go to the worst parts, but what I saw that day made me have a lot of respect for the men who worked so hard underground. I had never given one thought to how far they had to walk underground to get to the coalface. The men who worked so hard to bring us coal had to spend many hours away from the sunlight and when they came up after a long shift they did not have any pithead baths to use but had to trudge home to get washed in a tin bath in the kitchen. Finally Mapperley pit did get baths but it was not all that long before the closure of the pit. Les got a book for me about the Derbyshire miners and I found out that luckily women and girls had not worked down the mines in Derbyshire. In other counties of Britain, women did work down the pit, very often stripped to the waist and working with men. However, boys as young as five did work underground and they worked for fourteen hours a day. Fortunately that had changed much earlier. I was down the pit for just a couple of hours but it made me realise how much we owed to the men who became miners. They were prepared to risk life and limb and work in the most horrible conditions to give our country the fuel it needed. They were the salt of the earth. No wonder they liked to "wet their whistles" by having a pint or two at The Old Black Horse or The Candlestick and maybe a game of cribbage, dominoes or enjoy a game of darts or cards. I will never forget Les and how he opened my eyes. He knew what he was talking about for he worked down the pit for many years. 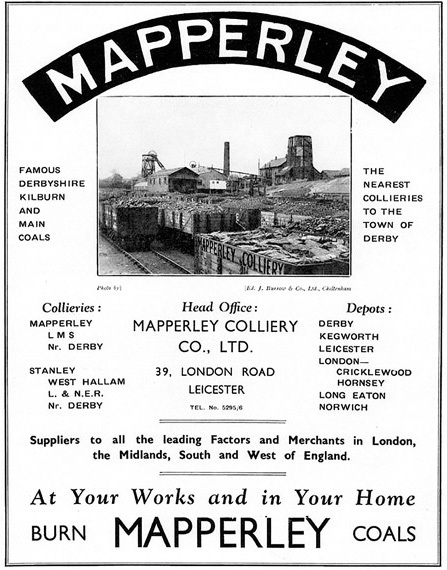 The Mapperley Colliery Company Poster is from a programme for the Royal Agricultural Show, the final time it was held in Derby, 1933, on what is now Ascot Drive Industrial Estate. The poster shows Stanley Pit. 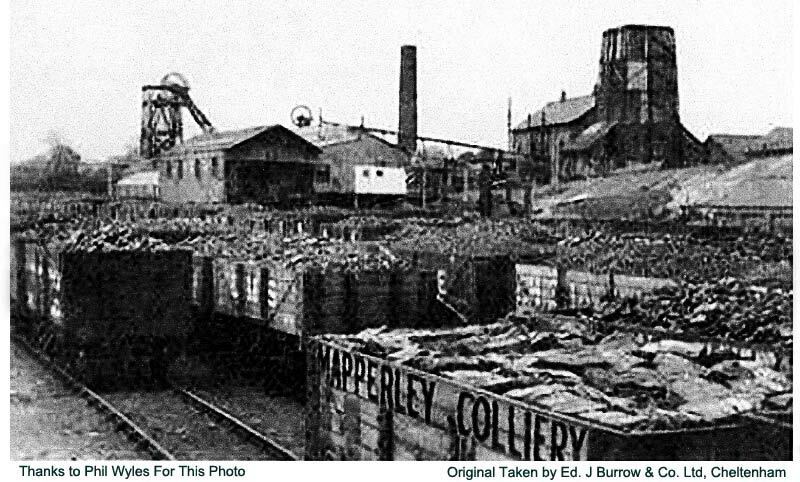 I suspect that Mapperley Colliery Co. promotional pictures featured Stanley pit due to the easy access and view from West Hallam railway station. The 'Main' coal referred to in the poster would almost certainly be the Low Main coal being worked at Mapperley Pit at this time, with the Kilburn from Stanley Pit, a later sinking continuing to work local Kilburn coals (some of the most prized house coal in the country) after exhaustion at Mapperley itself. Shipley Kilburn coal was apparently the coal of choice for the grates of the royals at Balmoral. Thanks to Joe Henshaw for this information. The above picture is known to have been taken in 1940, I believe by H.C.Casserley but don’t quote me. The reason the brake vans in the foreground are lettered “N.E.” is that they are in standard LNER livery. While it is true that the Mapperley wagons are not out of place, by this date private wagons had been pooled by the government under emergency WW2 measures which accounts for the appearance of the Holly Bush colliery wagon, some way from its home colliery in the Walsall area. Stanley (Nibby) pit. The Mapperley wagons would have been there as the same company owned both pits at this time. I suspect the picture was taken from the upstairs of West Hallam station. Another giveaway is the fact that one of the guard's vans has NE on it, i.e. North Eastern Railway Company which ran on the Great Northern lines seen towards the front of the picture (NE and GN amalgamated (grouping) in the 1920s to form the LNER). 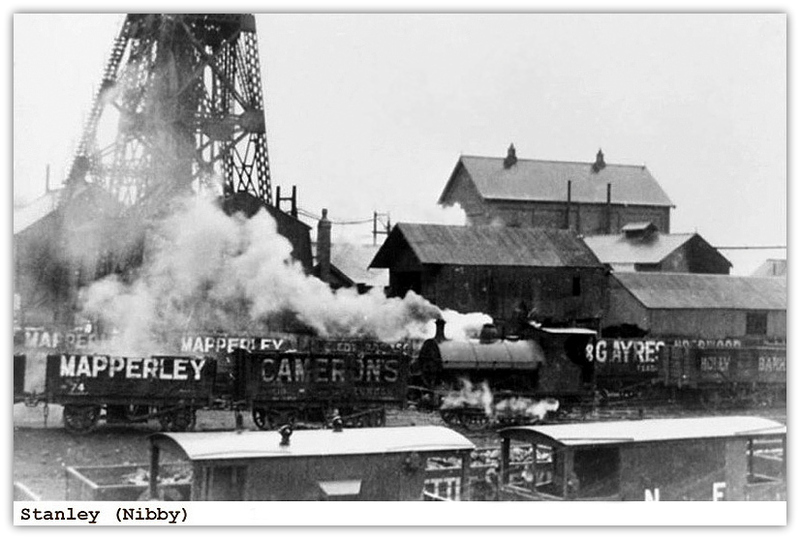 Mapperley Colliery itself was served by the Midland Railway (later LMSR), not the GN/LNER. Mapperley wagons could access the GN via an interchange at Mapperley Junction at the Eastern end of what later became the West Hallam coal screens and just South of Nutbrook Sidings, which were reckoned to be the biggest coal-traffic sidings in Europe at one time. 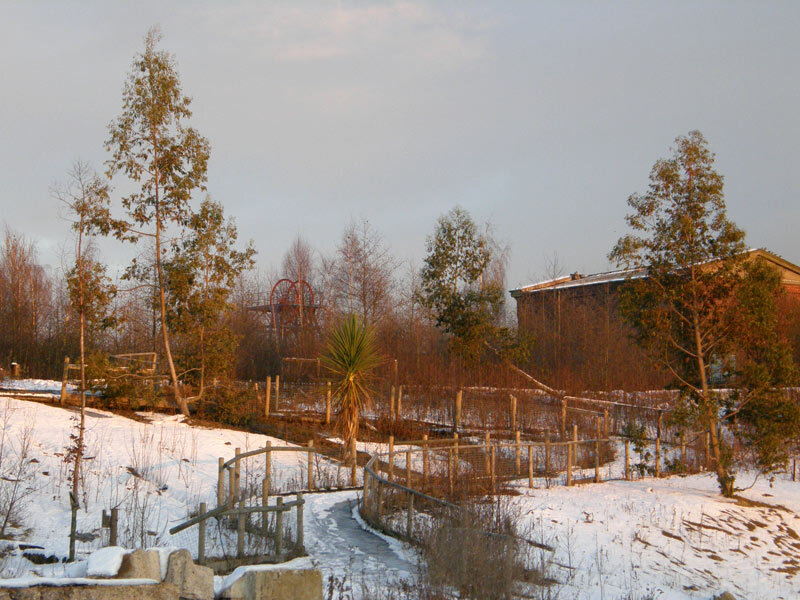 There are still bits to be seen where the opencast didn't quite sweep everything away, and UKC's failure to opencast Shipley West helped to preserve a few remains. The "Shipley Woodside Colliery Oct. 1953" shows the No.2 (downcast) Piper shaft which was sunk to the Kilburn coal by 1899 (about 1550ft deep). Piper coal, and others were worked from here after the Kilburn was worked out in ~1934. My granddad spent all his underground life in the Kilburn; it ruined his health and he had to finish his working life working on the surface, dying prior to retirement. Shipley Kilburn was reckoned to be the best house coal in the UK, and fuelled the fires at Balmoral. Some of the buildings still remain as the Piper shaft was used for pumping after closure; it remains the most important strategic pumping station in the area, and dewaters mine workings/controls the water table for miles around (Annesley, Langton, Calverton and beyond to the East, and similar in all other directions). The actual winding gear continued to be used for pump maintenance, until RJB Mining (now UKC) cut them down for scrap rather than pay the maintenance bill, preferring to use cranes instead. They sold the winding wheels to Bassetlaw District Council for memorial purposes, prior to realising that this had utterly incensed local people just when the company was applying for opencast at Shipley West. They blamed everyone for the scrapping of this supposedly preserved monument, including the Coal Authority, and Newark and Sherwood District Council (???) who they said had condemned the structure, even though it is in Amber Valley! The winding wheels were retrieved in a panic, and now sit on top of the monument built by local people. However, these are not the wheels in the picture, as they were replaced with the smaller ones we now see when the transition to a pumping station was made. The winding house still stands out of shot to the right, and houses all the electrical switchgear, and the now redundant pump winch; you can still see where the remains of the diagonally-rising support legs have been cut-off to this day. At the Woodside Pit, there are two winding shafts, each 7 feet in diameter, drawing upwards of 1,000 tons per day from the Main Soft coal, at a depth of 216 yards. The output was doubled by duplicating the vertical winding engine, by pulling tubs off both decks at once, and the introduction of extensive banking machinery. The boilers, of Lancashire and egg-ended types, are fitted with the Perret system of forced draught, and fired with coal-dust carried by a conveyor from the shaking screen to the end of each boiler. The ventilation is provided by a Rammel fan. The underground haulage is on the side system. At the Coppice Pit, upwards of 1,100 tons are drawn per day from one shaft of 13 feet diameter. The seams worked are the Deep Hard (0r Potter's Coal) at 204 yards and the Main Soft coal at 187 yards. A single engine on the surface works bucket pumps and three-throw pumps delivering water from the Deep Hard coal to the surface, and also works about 4 miles of underground haulage of the under-rope type. A sorting belt and screen are in use, and a second belt and screen is in the process of construction. This colliery is ventilated by a Guibal fan, 30 feet in diameter and 10 feet wide. There are three pumping plants. One erected in 1819 pumps from the Bottom Hard coal by two treble lifts ; another of uncertain date pumps from the Top Hard ; and a plant is nearly completed, consisting of a compound surface condensing horizontal engine, with cylinders of 45 inches and 80 inches in diameter,and stroke of 10 feet, to work two 20 inches plungers at a depth of 240 yards, and two 9 inches plungers at 100 yards. The new boilers are fired on the Perret system.